Discussion in 'Performance Lighting' started by thewishkah, December 19, 2004. Looking good....What mod.# lights are they? Looks like a good beam pattern for fogs. why do my pics keep disapearing? they are model # pl-961w they are i guess more of a "halogen driving lamp" but they light up everything like day. I have never seen fogs put in that location before so I figured Id try it. Cardomain finally blocked hotlinking. Now you gotta become Elite. those bast@$%^ lol ! I guess they have the right to do that huh. why would you ever need remote control foglights? Not as many wires to run? are those the 55w lights? Where did u get them? Pepboys?? If so maybe that is why they dont work that well in the grille. BTW do you have any pictures of your truck? 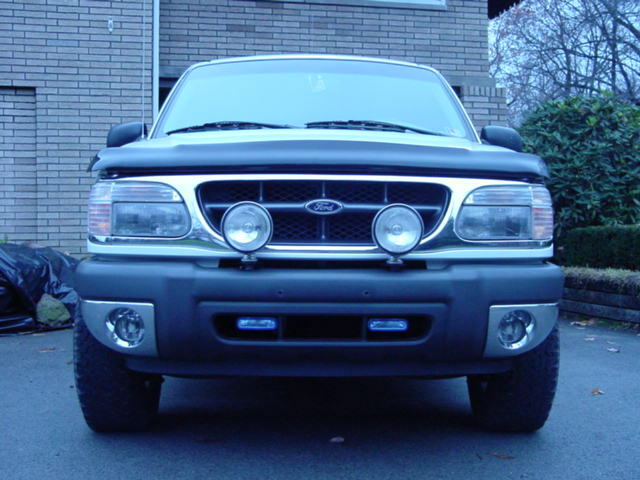 I was thinking of installing 4 Whelen TIR3's in the grille and a 8 pack of strobes, 4 front 4 rear plus a slimlighter LED above the rear view mirror and 2 tir3's out the rear window...any suggestions on how ot wire them or such? They work well they were just hard to mount where i did cause of such the tight spot. The remote is good cause i already have ALOT of wiring under the dash and i didnt feel like trying to sort through it and make it neat to run the new wires. Another good thing about the remote is I can turn them on before i get in the car and "make sure there is no one waiting for me" lol I know lame reason lol. and yes they are the 55w ones very bright. into the track that goes along the doors and then up over the transmission (under the rug) and through the fire wall. Another good thing about the remote is I can turn them on before i get in the car and "make sure there is no one waiting for me" lol I know lame reason lol. Thats not a lame reason at all, I was thinking of getting a remote for just the same reason. Good job on the install, they look great! thanks i dont know if anyone has done it before so i tried it and it worked great. I actually upgraded to 100w bulbs. (you can buy at the same store) also I angled them ot the sides, if you want it adds a better side dispersion of light to light up the sidewalks in town or the shoulder of the road on those dark windy ones. Lastly did you switch the power for all of your lights or did you use relays? wouldnt 100w bulbs in lights that are meant for 55w bulbs cause some issues? such as melting or over loading the wiring ? If not I would do that for the added light. as for the lights and sirens I have a federal signal control box that runs power from the battery to all my power supplys. I have some pics of the wiring but not much just where its run down the side of the car (I took those pics while installing my 16g speaker wire and bypassing the amp) Ill email you what I have. Have the same lights. Last time I tried wiring them up with a normal switch I about caught the truck on fire, my fault, they are a nice light. Although I could go for a normal clear lense and not the blue. Here's mine mounted. Similar place as yours. that looks real nice Im jealous that you have more room to work on the mounting lol I kept mashing my hand into the bumper trying to screw in the mounts lol. Does anyone know if they higher wattage bulbs will cause adverse reactions? I have the same ones, but I put in some sliverstars, They are so much brighter with the sliverstars in. how much are the silverstars that fit into these lights?